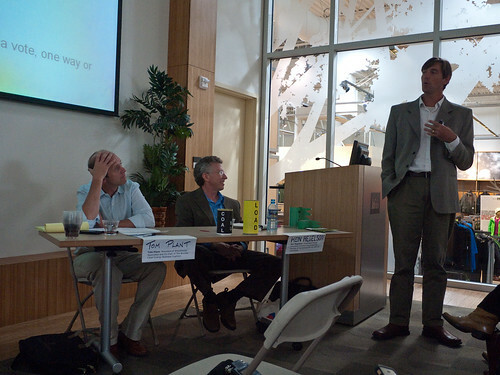 Last Thursday (Sept. 8th), the Boulder Green Building Guild (BGBG) and Boulder Tomorrow hosted a debate of the 2B/2C ballot measures. The event was completely booked in advance through the BGBG’s website and the REI community room was packed and buzzing with members of the city’s considerable sustainable building and design community. 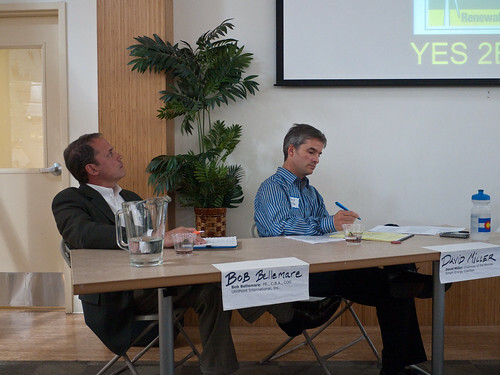 Personality-wise, it was mostly a re-match of the folks involved in the PLAN-Boulder event from a couple of weeks ago with Bob Bellemare (Utilipoint) and David Miller (Boulder Smart Energy Coalition) speaking against the measures, and Ken Regelson (RenewablesYES!) speaking in favor. However, instead of Sam Weaver sitting next to Regelson we had former Colorado state legislator Tom Plant, co-chair of the Boulder Clean Energy Business Coalition, and former head of the Governor’s Energy Office. Also present was Jonathan Koehn, the City of Boulder’s Regional Sustainability Coordinator. 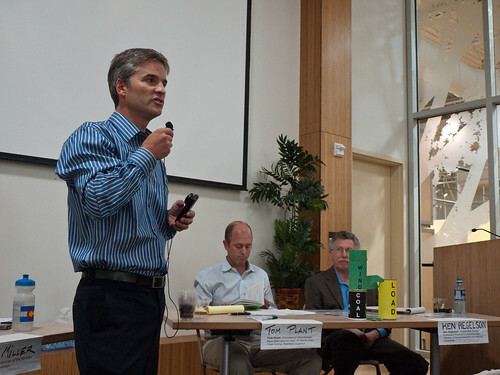 He was on hand to speak to matters of fact alone, as the city is required to recuse itself from advocating one way or the other on the ballot measures. All in all, the “against” side seemed somewhat more polished, but essentially unchanged, and still very focused on fear, uncertainty and doubt. I thought the “for” side focused less on the technical and quantitative aspects of the initiatives, and more on the benefits of moving our electrical generation much closer to home, both in an economic sense (keeping our energy dollars in our community, involving local businesses in development and innovation) and in a regulatory sense (removing ourselves from the statewide public utility commission process, and making the relevant governing bodies much more accessible). The “for” side also repeatedly pointed out that the purpose of the ballot initiatives is, in large part, to empower the city to remove much of the uncertainty surrounding the formation of a municipal utility. What follows is my attempt to summarize the content of the debate. Anything not in “quotes” is my attempt to paraphrase the speakers, based on my notes. In the interest of full disclosure, while I am in favor of passing 2B and 2C, I am working as a volunteer only, and receiving no compensation. Hedging against the possibility of an uncertain energy future, with potentially volatile fossil fuel prices and supply issues. Positioning Boulder as a center for innovation in the fields of renewable energy and energy efficiency (or as NY Times editorialist Thomas Friedman likes to say, ET). Meeting our moral and ethical obligations to future generations with regards to our consumption of finite material resources, and the curation of our habitable atmosphere. Koehn also pointed out that within the municipal non-profit utility option, there are many different ways to go about meeting our local goals, and made it very clear that while there haven’t been a huge number of municipal utilities formed recently, it’s by no means an unusual way to get your power in the US. In Colorado alone, there are 29 other municipal electrical utilities, including Fort Collins, Loveland, Longmont, and that bastion of socialist fervor… Colorado Springs. Nationwide, there are about 2,000 munis, serving about 14% of the US customer base. 2C also gives the city the authority to issue bonds to pay for starting up the utility, and the creation of a citizen board which would oversee its operations. After Koehn’s setup, each side got to make 15 minutes worth of introductory statements. First up was David Miller. He said the sole purpose of the $12 million raised by the Utility Occupation Tax is to “fund the fight against Xcel,” and that 2C does not actually require any municipal utility created by the city to reduce GHG emissions or increase its renewables fraction. (This is true, but the initiative does require a concrete “plan” to those ends. There are no binding emissions/renewables targets partly because without doing the technical legwork which 2B would fund, we can’t know what the rate vs. emissions vs. renewables tradespace will look like.) Miller claimed that the muni option is too slow and risky, and that “there are better, quicker options” to get the clean energy that we want. He didn’t elaborate on what those options might be. He again pointed out that the cost of the whole utility start up is as of yet unknown, and will only be determined through lengthy negotiations and, potentially, litigation. Nobody is disputing this; in fact one of the main purposes of the ballot initiatives is to give the city the ability to figure the costs out concretely. He again made the point that after this vote, we won’t have direct say in whether the city decides to form a utility — City Council will have the authority to do so (within the bounds set out by the ballot language). However, in a community as politically engaged at the local level as Boulder, it’s hard for me to imagine council going ahead if it was clear that the move didn’t have popular support. It seems like it would be politically… difficult, and as Bob Bellemare intimated in the first debate, we can always vote the bastards out if we don’t like what they’re doing. The Xcel side seemed to be appealing repeatedly to our supposed distrust of government and bureaucracy. Miller mentioned that our municipal utility would no longer be under the purview of the Colorado Public Utilities Commission, which is supposed to represent the interests of the public in the regulation of the utility monopolies. This is true of course. Instead, it would be governed (that is, regulated — not operated) by a locally appointed utility board, and the City Council. To me, this sounds like a much more accessible level of governmental control. I’ve been to Council meetings. I’ve talked to the mayor and council members and city staff about issues that concern me. At the state level, that becomes a much more challenging proposition. Regardless of whether you think creating a Boulder Light and Power utility makes financial or technical sense given our goals, it would clearly localize our decision making processes, and in this era of distant, dysfunctional, corporate influenced governance, that seems to me a good thing. On the financial side, Miller also noted that Xcel’s rates are below the Colorado median, and that Boulder takes far more than its fair share of Xcel’s efficiency and renewables programs. For every $1 we put in as ratepayers, our community has gotten back $4-5. That’s definitely some kind of deal, but it strikes me as a kind of cheating. Obviously it’s not a solution that can scale up to work at the state level, and it’s only made possible by other communities failing to embrace efficiency and renewables. Miller also said that while all of Colorado’s municipal utilities are very reliable, they’re also by and large very dependent on coal, and that Boulder’s potential focus on a high renewables fraction might somehow make us less reliable. If it’s a foreseeable failure of reliability, this scenario is expressly forbidden in the ballot language. Even if it wasn’t, in the broader view of things, if we really do care as a species about stabilizing the Earth’s climate without reverting to a pre-industrial society, then somebody somewhere is going to have to figure out how to make renewable power also reliable power, and it’s not as if we’re going to cut ourselves off from the rest of the grid in five years and suddenly jump to 100% wind and solar in a leap of blind faith… silly YouTube videos notwithstanding. Finally, Miller talked about GHG emissions and climate change directly. He noted that the city is set to fail in its bid to meet our (voluntarily imposed) Kyoto GHG goals by 2012. He said we need to focus on heating, efficiency, and transportation systems too. All true, but unfortunately, every one of the major emissions sectors — transportation, heating, electrical generation, agriculture, etc. — must be tackled aggressively if we are to make the 80-90% reductions in GHG emissions required to stabilize the atmosphere. They are all necessary, and each one alone is insufficient, so we need to work on all of them now. He suggested that Boulder as an entity is too small to make any difference in the larger scheme of things, and that we’d have more impact by continuing to influence Xcel more broadly in the context of Colorado. How exactly this influence was to be exerted was left unsaid. I thought this was a strange juxtaposition — first, that we are going to fail to meet our 2012 climate goals, and second, that we should just keep doing what we’ve been doing, and hope that it turns out better in the future than it has so far. Bob Bellemare took a different tack in his half of the introductory statements. First, he did his best to convince us of his credentials. He’s a professional business appraiser. He’s spent 25 years in the utility industry. He’s managed a 14 gigawatt generation fleet. ‘Been involved in almost every similar potential municipalization case in the nation over the last decade. I haven’t checked, but I presume these are true statements. However, just because someone possesses a particular expertise doesn’t mean that they are wielding it on your behalf. The appointment of many Goldman Sachs alumni to positions within the US financial regulatory bodies is a great example of this. Certainly Hank Paulson (former Goldman CEO) understands the market as well as anyone, but that doesn’t mean you can expect him to do a good job of overseeing it in the public’s best interest as Secretary of the Treasury. So it is here. I have no doubt that Bellemare understands what’s going on in this debate, but his interests are Xcel’s and not ours, and so his experience and expertise should, if anything, make us wary of what he has to say. After extolling his own virtues, Bellemare went on to display lots of frightening financial numbers very quickly, without making much effort to explain what they meant. The main takeaway point was that it could end up costing as much a $1.2 billion to get a municipal utility off the ground in Boulder. Of course, we don’t get to see where Xcel’s numbers come from. To use them, we must simply have faith that the company is, as its slogan states, Responsible by Nature™. This is in stark contrast to the analysis by the city’s consultants and the citizen’s modeling effort put together by RenewablesYES, which both offer no end of gory detail about their assumptions, inputs and processes. More than anything listening to Miller and Bellemare, I got the impression that they were doing a very good job of staying on message, with the same Fear, Uncertainty and Doubt approach that they’d taken in the PLAN-Boulder debate (Miller has the role of Uncertainty, and Bellemare is in charge of both Fear and Doubt). It was somewhat more polished, but none of the substance had changed. The pro-municipalization side brought a fresh face to the table with Tom Plant, in lieu of Sam Weaver. The addition of his political experience definitely changed the character of the team, providing a nice counterpoint to Regelson’s more technical approach. I suspect this combination will appeal to a broader audience than the purely quantitative duo. Plant listed the main goals of the Boulder Light and Power initiative as localization, decarbonization, democratization, and decentralization, and framed the issue as being about finding the best way to address those goals, either with our own utility, or in partnership with Xcel. We’ve been working within the framework provided by Xcel for years, but in Plant’s opinion have not been able to find an acceptable way forward. He was adamant that passing 2B and 2C does not commit us to forming a utility, and emphasized that passing these measures do not take any options off the table. Rather, he sees them as simply giving the city the ability to even seriously consider the municipal utility option. He sees localizing our power systems as a way to keep more of our energy dollars within the community, and anticipates a lot of participation from local renewable energy companies in the creation of a system that works, positioning them well to help other communities in similar endeavors. He sketched three scenarios for our energy going forward. We might decide to simply buy our power from 3rd parties through wholesale contracts, and focus our efforts locally on demand side management, energy efficiency, and distributed generation, or we could go ahead and do a lot of our own generation, or we might end up being able to negotiate an acceptable deal with Xcel. He pointed out that passing 2B and 2C would actually put us in a much stronger negotiating position with the utility, if that’s what we decided to do. He lamented the fact that Thomas Edison would still recognize and understand the structure of our grid today, despite all of the technological change that’s taken place in the last century, and questioned whether we really want that to be the case for our grandchildren, which is the future he sees resulting from continuing to rely on centralized fossil-fuel based generation. Regelson began by describing Xcel’s plan as “Coal to 2069,” referring to the anticipated retirement date of Comanche 3, their most recently completed, billion dollar, 750MW power plant. 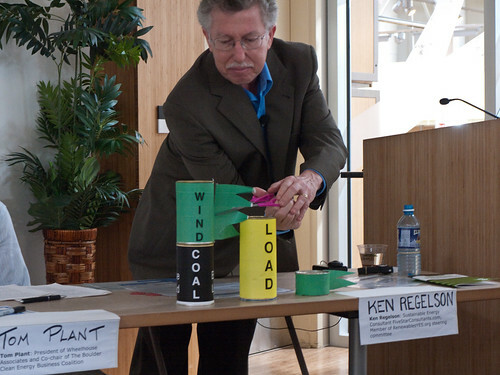 In contrast, he summarized the results of the RenewablesYES citizen’s modeling effort as: 40% renewables and a 2/3 reduction in carbon emissions, while maintaining rate parity with Xcel, and he was keen to point out that all the data and modeling behind those numbers are publicly available, unlike Xcel’s estimates. He explained wind curtailment costs — because wind is variable, and coal plants can’t be turned on and off quickly, sometimes Xcel ends up dumping wind power, when it would exceed the grid’s demand. In 2007, these costs were only about $120k, but as more wind has been integrated into the grid, they’ve exploded, nearing $4M in 2010. The problem will only get worse as more renewables are added — baseload coal and variable renewable power just can’t play well together. Just switching from coal to gas cuts our GHG emissions roughly in half, but more importantly, it allows us to integrate more renewables into the mix, as gas plants can be turned on and off quickly, allowing the grid to absorb whatever wind and solar there is available, and using the fossil fuels only as backup “firming” power. Like Plant, Regelson emphasized the fact that we simply cannot get accurate estimates of a municipal utility’s startup costs without passing measures like 2B/2C, and enabling serious negotiation from the city’s side. He asserted that even if the startup costs were as much as $810M, we could still do a 50% reduction in carbon emissions while maintaining rate parity, and that a 68% reduction would be similarly possible, so long as startup costs were below $560M. Written questions were then posed to the panelists by the moderator. Each side had 3 minutes to respond, and could split that time as they saw fit between the two members. Q: What is your organization’s position on climate change and the Climate Action Plan? David Miller admitted that climate change is a very serious problem, and that coal is a huge contributor, but emphasized the need to look at other carbon sources as well. He also touted Xcel’s wind farm proposal (despite the large curtailment costs that would have resulted from it). He urged us to continue working with “the greater community” in Colorado, as he believes that any actions taken by Boulder independently will prove insignificant in the grand scheme of things. Bob Bellemare remained strategically silent, letting Miller have all 3 minutes. 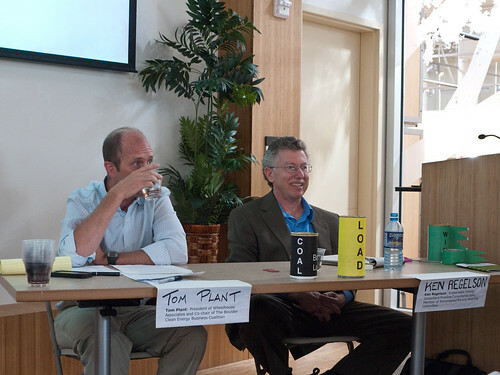 Tom Plant described stabilizing the climate as one of the greatest challenges of our time, and disagreed that Boulder’s local actions are immaterial. Demonstrating that these changes are both possible, and economically feasible will set an important example and precedent, and embolden others to do the same. He agreed that we’re not going to come anywhere close to meeting our 2012 Kyoto goals, and attributed a lot of that failure to our inability to separate ourselves from coal-fired power. 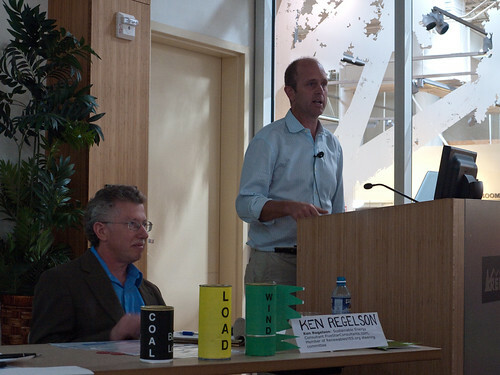 Ken Regelson said that carbon is a huge deal, and that he’s dedicated his life to mitigating climate change, both professionally and as a volunteer advocate. He noted that while we’ve done better as a community with renewables and efficiency measures than most other cities served by investor owned utilities, we’re not doing as well as Sacramento, CA or Austin, TX with their municipal utilities. He called into question the practicality of Xcel’s wind deal, because of the large curtailment costs that would result. Q: What about stranded asset, separation, and “going concern” costs? Ken Regelson: Big range in cost estimates here from $0 (city) to $huge (Xcel). Only rural electrical co-ops are explicitly given value as “going concerns” in the law. Xcel will have to sue to set such a precedent for an investor owned utility. Seems like it will be a difficult case to make. According to consultants hired by the city, separation of our infrastructure from Xcel’s will be a piece of cake, due to the near continuous greenbelt we’ve surrounded ourselves with. Their informed cost estimate was $7.5M total. The city doubled that to $15 in their financial modeling, which is still a far cry from the $100M number Xcel is throwing around. Bob Bellemare: Spent most of his 3 minute response talking about his credentials as a business appraiser, power engineer, and expert witness and asserting his status as an authority on the subject in a very serious voice, before describing Boulder’s city boundaries as “Swiss cheese,” and asserting that it would be very expensive to separate. Tom Plant: You’ve heard two sides with wildly differing numbers. The only way to actually get a final estimate is to pass 2B/2C and put together a detailed separation proposal. Q: If we separate, where will our power come from? David Miller: We have no idea. Bob Bellemare: You won’t know until 6 months before your utility begins operations. The ballot language doesn’t say anything about this. Wholesale power could be 65% of your operating costs. You might lose what wind power you’ve got now. Tom Plant: As a wholesale power utility, we will have the power to go to the market and shop around, to competitively bid our supply contracts. Xcel customers will be locked in to carbon because of the way it generates its profits, and the large investments it has made, and is redoubling, in coal. What if we actually end up pricing carbon effectively? Ken Regelson: Initially we will probably bid power production out to many independent suppliers. There are lots of companies interested in this kind of contract. Tiny Marin got 12 qualified responses to their request for proposals, and we have a much higher profile than they did. Southwest generation has 1GW of natural gas in Denver (we only need at most 285MW) and they’ve got a contract with Xcel that expires in 2012, which Xcel has decided not to renew. They’re already interested, and are members of the Boulder Clean Energy Business Coalition (which Tom is representing). Jon Koehn: Point of information: the city looked at many different plausible scenarios with different renewable energy portfolios. We currently have a request for information (PDF) out on the street asking for proposals, due back on Sept. 16th. We’ve already gotten 9 responses. Don’t know yet if they are real credible offers, but keep an eye out on the city website for more information as it comes in. Q: What is the biggest misconception the public has about your organization’s position? Tom Plant: Well… we’re only now taking a position, so people can’t be confused yet! We’re in favor of 2B/2C because we want to take an innovating position in the market. The real decision is not being made in November. We are not committing one way or the other now, we’re just talking about whether to give the city the power it needs to fully explore all the options, despite what Xcel says about this being some kind of point of no return. Ken Regelson: Polling has shown there’s a lot of support for the municipal option. There’s a misconception that what we’re talking about doing here is somehow strange or unique. It’s not; there are lots of other municipal utilities out there. David Miller: I don’t think there are any misconceptions about us out there. The notion that we’re not committing ourselves is incorrect. We won’t be able to stop once we’ve started. We’re already spending money, and it’ll be nearly $2M/yr going forward. We don’t have the time to figure this out and work through the process, which could take many years. There’s a misconception that a municipal utility is some kind of proxy for clean, green energy, which just isn’t true. At some point, we have to make a resource choice and finally pay for it. 2C doesn’t say anything about our future resource mix. Bob Bellemare: Condemnation is a difficult process. It’s very divisive for the community, and creates bad blood with the utility. You’re committing with this ballot measure, and you have no guarantees as to what you’ll get in your energy mix going forward. The city plans not to do any debt service on its bonds for the first 1.5 years of operations, so of course you’ll have lower rates then. 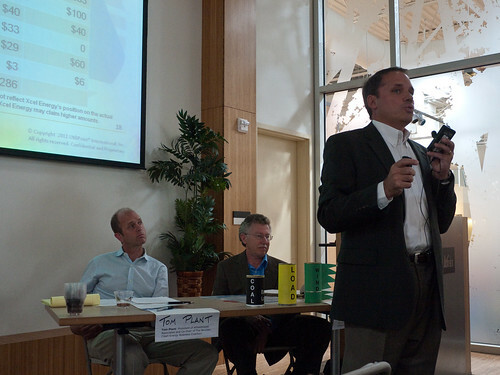 Q: Is the City of Boulder qualified to run a utility? Bob Bellemare: Clearly today you don’t have the staff, nobody with those skills on hand, but you’ll still be making these decisions, about assets with 20-50 year lifetimes. Of course cities can run utilities, but there will be growing pains, and the first few years will be a mess. Where will you get the linemen? It costs a lot of money to build competency. David Miller: City doesn’t have it, obviously. We’re going to have to learn and/or build it. Tom Plant: We already run several utilities (water, sewer, roads, etc.) We’re surrounded by cities that run their own utilities (Ft. Collins, Colorado Springs, Longmont, etc.). A municipal utility can engage with the local community in a much broader way, and we have lots of really high quality local resources. Ken Regelson: From a technical standpoint, for the first 5 years it will certainly make sense to outsource this expertise, to bid it out competitively, and learn from the experiences of the experts we hire. Investor owned utilities have much higher overhead. Consultants, highly paid executives, lawyers, etc. In fact I recognize quite a few Xcel staff in the room right now on company time! The city is extremely fiscally conservative. We have a AAA bond rating, which we’re not going to jeopardize. Financially we can do this, and we can buy the technical expertise while we build our own core competency. Q (from Tom Plant to Xcel) if 2B/2C doesn’t pass, we’re left with Xcel (with or without a franchise). Why would it be in the city’s best interest to limit our options today by not considering municipalizing? David Miller: It’s in the city’s interest to take advantage of the existing Xcel programs. It doesn’t benefit us to be reclusive on this issue. We can’t choose a daunting, expensive, time consuming process and expect others to follow in our footsteps. Let’s just keep doing what we’ve been doing. Bob Bellemare: If you vote no, you don’t lose the option to do this again in the future. You have such a good relationship with Xcel today, why sour it? If you municipalize, you’ll no longer be part of the discussion at the Public Utilities Commission. Currently you get 5x as much money in solar and 4x as much money in energy efficiency as you put in to those programs as a community. How can you hope to do better than that? Ken Regelson, rebutting Bellemare: Jefferson County, WA voted to condemn, and within 4 months they had a settlement with their utility. It was an easy process. A lot of this talk about “souring” a relationship is just posturing. Corporations (and nations) have no friends or enemies, just interests. Q (from David Miller to Plant/Regelson) We’ve had significant benefits with the current arrangement with Xcel. What’s really the benefit of this separation, and all the overhead it brings? Tom Plant: We’ve collaborated with Xcel for 12 years, and I’m proud of the work we’ve done in Colorado. I don’t hate Xcel, I congratulate them for making changes to their fuel mix (from 90% to 60% coal). Their actions have benefited communities that, left to their own devices, would have done nothing whatsoever to mitigate climate change. However, Boulder is not one of those communities. Allowing Boulder to separate will let us similarly pull Colorado forward, both materially and by example. Today Xcel is holding us back. Ken Regelson: Xcel has come a long way for an investor owned utility, however, we want to see much, much more, and you simply cannot get there while relying on baseload coal. Shifting to renewables will bend our rate curves down. Renewables get cheaper with time, unlike fossil fuels. At the state/CPUC level you can’t get your voice heard as a community of 100,000. It’s much easier to participate directly at the city level. I’ve worked with the PUC as an expert witness, I know what the process down there is like. Tom Plant: The other side says we shouldn’t do this because it’s hard. They say Xcel is good enough, that we’re better off working through the PUC and the Colorado legislature. Having served in the legislature for eight years, and worked with the PUC as the head of the Governor’s Energy Office, I can tell you firsthand that the process down there is arduous. However, we do have good communication with our city government. Our local democracy works! Our local Green Building, SmartRegs, and Carbon Tax regulations have all been developed in close cooperation with the BGBG. We have lots of great local expertise in these areas, and creating a local utility will allow us to leverage that expertise in the field of renewable generation, and set an example for the rest of the nation, and the world. I’m doing this as a volunteer because I want to see us take advantage of this great opportunity. Ken Regelson: WE CAN DO IT. 40% renewables, 67% reduction in CO2, and rate parity. We want to be able to tell our children and grandchildren that we did what needed to be done in 2011! David Miller: Let’s work on this NOW! Let’s keep doing what we’ve been doing! We don’t have to wait for it to come to us. Wish as we might for clean energy, 2B/2C doesn’t guarantee it. Bob Bellemare: Is this really the best way to meet your goals? What else could you do with that $12M over 6 years instead? Is this the best possible use of $300M in Boulder? Will you really make up what you lose in economies of scale with Xcel? Will you have enough money to replace our solar rebates and other programs? Jonathan Koehn: Continue following this issue online. All the city consultant reports are online. Check out our Know Your Power Community Guide v2.0. Get informed before you decide!